US cinema advertiser National CineMedia (NCM) recently held its upfront, during which is sells advertising much like television networks do, based on the upcoming movies/shows. NCM’s new CEO Andy England argued that Millennials are turning up for cinema in greater numbers and had the statistics to prove it, in an upbeat message about the future of the medium. Having laid to rest the ghost of the failed Screenvision merger, NCM is clearly focused on being a data-driven company on a mission to beat the US television networks to the most coveted demographic. The presentation was opened by NCM’s newly appointed President (but veteran of the company) Cliff Marks, who fired a shot across the bow at the television networks, in claiming Millennials for cinema and its advertisers, rather than NBC, ABC, CBS, Fox or any of the other networks. Marks also announced that NCM’s co-operation with Audience Entertainment and TimePlay is going well and will be launching on 500 screens and expanding to over 1,000 screens in “the near future”. This clearly tries to capture Millennials through engagement on their favourite device – their smartphones. 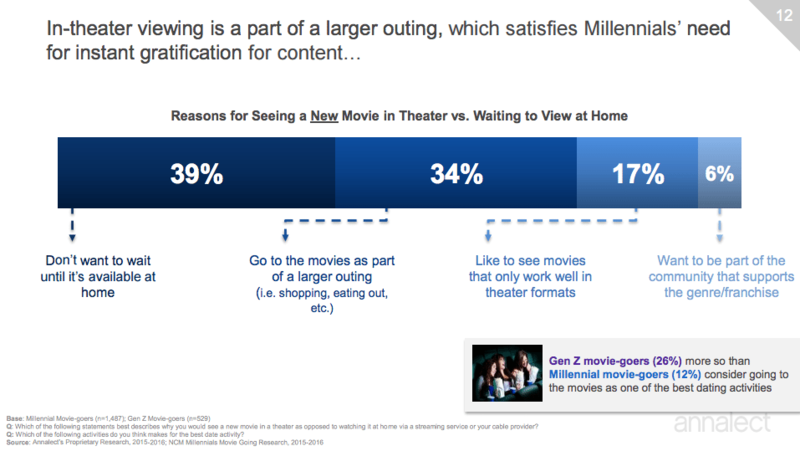 In drilling down into the detailed findings the study found that movies play an important role in Millennials’ lives, with 62% saying that they “like” movies; were influenced by them, with 38% saying they had a changed social, political or environmental view after seeing a film, while a third (35%) go so far as to “consider movies a passion/important.” Franchises are important to them (see the diagram top), but perhaps not to the extent that you might think. Though those that are passionate are very passionate, which is where the term ‘fan boys’ (and girls) comes into play. Echoing the recent findings of Movio, Millennials turn out in greater numbers on opening weekend. Paul Dergarabedian, senior media analyst for comScore, was on hand to point out what a strong year 2015 had been at the box office and why things are looking rosy for 2016 and 2017 as well. Dergarabedian went on to affirm that the “overall growth is not an anomaly, it’s a long-term trend,” due to the communal and immersive aspect of cinema. Interestingly the single biggest motivator for going to the cinema was not talking about the film on social media, but “to get out of the house on a night out,” which 40% of the surveyed listed as the top reason. This was followed by “enjoying a movie on a big screen with great sound system” (37%), “to escape the real world” (14%) and just 10% said “to connect with friends and discuss the movie after viewing.” So getting away from mom and dad is still the most compelling factor for movies when it comes to teens and Millennials. It turns out that Imax and dine-in theatres are only minor attributes for attending at 20% and 18% respectively, with luxury seating even lower at 17% and reserved seating surprisingly bottom at just five percent. Interestingly 47% arrive early to get good seats (maybe reservation is not available? ), while 39% drive during the pre-show adverts but before the trailers, adding up to 86% in total, with only 14% saying they arrive during or after the trailers. Instant gratification plays a major part in motivating Millennials, as is evident from the diagram above. Perhaps cinemas should be worried that only 17% want to see “movies that only work well in theatre formats”, though is this the fault of the movies or the cinemas? 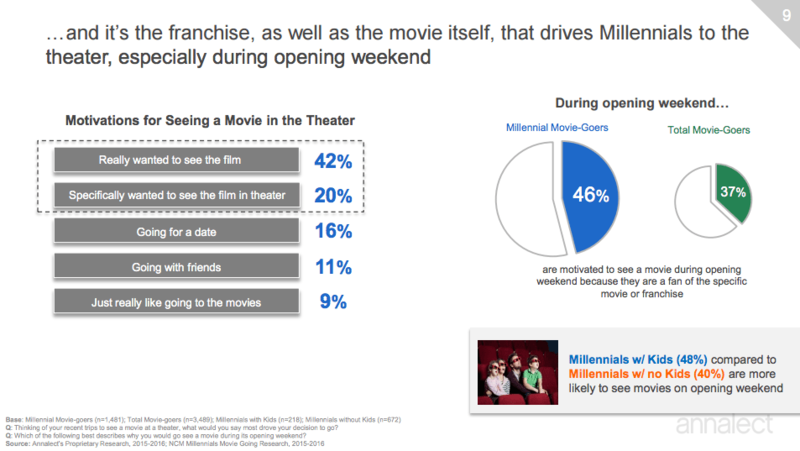 There seems to be even less support (six percent) for genre/franchise communities, though re-assuringly a quarter of the Gen Z sub-set of Millennials consider cinema a great place for dating. Finally trailers, whether in cinema or on YouTube, are more important than online reviews to Millennials and not surprisingly social media plays a role, with 53% of respondents using to to share recommendations about a film, while 51% use social media DURING the movie. Facebook (at 22%) and YouTube (at 18%) are the biggest social media influencers, ahead of Twitter, Instagram and ‘other’, all of which are in the low single digits. 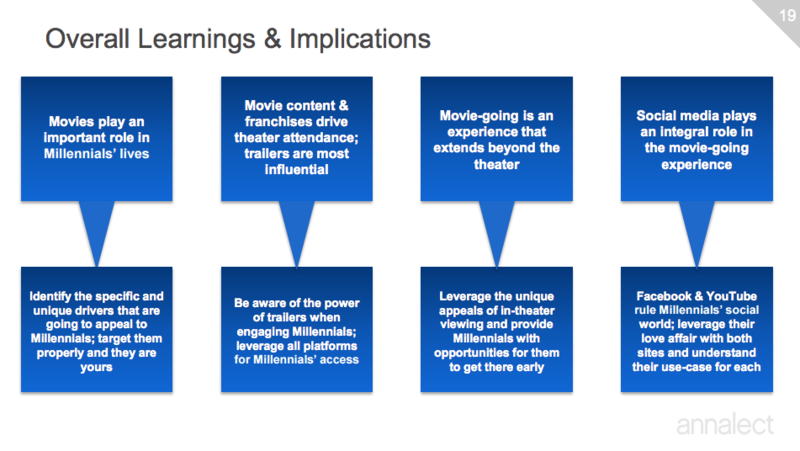 These insights are distilled into a set of Overall Implications & Learnings for cinemas, distributors, advertisers and brands. Together these tools help “quantifying business lift”, which in plain English means precisely knowing what if any impact your campaign is having. “NCM will put your brand in front of a huge Millennial audience watching the best content available, and support you with data and digital marketing,” CEO Andy English wrapped up the session with. 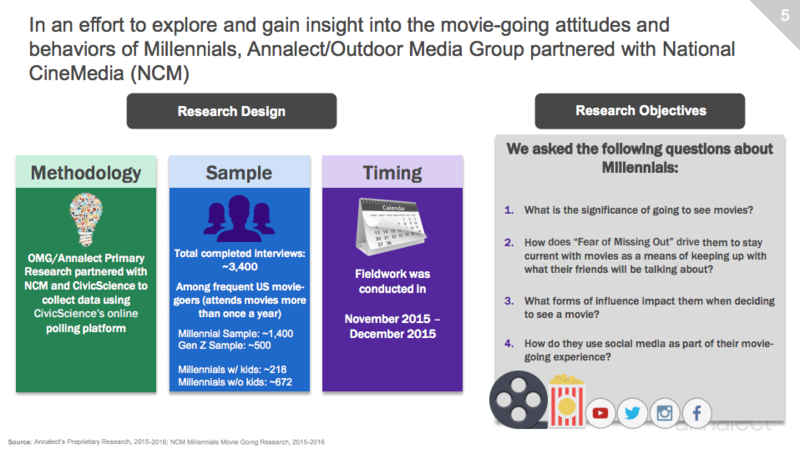 “Welcome to the movies.” Given NCM’s renewed sense of purpose and focus on Millennials and data, judging form this presentation, it could be that failing to merge with Screenvision could be the best thing that could have happened to NCM.